When John first started running it was for reasons that most of us do, he wanted to get back into shape and it was the easiest form of exercise that didn’t require any commitments to some gym or program. 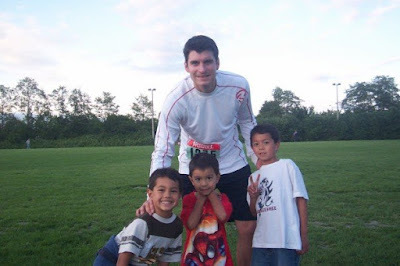 He also discovered that he actually liked running and that it helped him to take his mind away from life’s stresses. However, as much as John’s new passion for running took over his focus, he found that he missed something that he had always been a part of as an athlete; belonging to a “team”. John grew up playing soccer, baseball and basketball and his experiences on these teams allowed him to understand the significance of what it meant to be a teammate, more importantly, a good one! As a runner you get to decide if you want to push your limits in a race, or back off and take it easy, still whatever decision you make doesn’t affect the other racers, just you. The same cannot be said for a team sport, in fact, it is quite the opposite; your actions and decisions not only affect you, but essentially they affect the entire team. The beauty of team sports is the ability to think outside of yourself, and work together with others for a common goal. It is knowing that each role an individual has on that team means something and that no one individual is successful unless his team is behind him. John’s love for basketball and the success and failures that he has experienced playing this sport has taught him many life lessons beyond the game itself; lessons he does not take for granted, especially now! Today John’s “team” of specialized Doctors and nurses are no different then the teammates he had in sports...they each have a specific role to play in his treatment, they posses varying talents and expertise, and their common goal is their focus on John’s health and well being. John could not succeed without them and when he has experienced setbacks, they are there to help us find another way. These past several weeks have had it’s share of ups and downs...John successfully tolerated the first 4 rounds of his chemo treatment but as of late his bone pain has became more prominant. At this point we still do not know if this is the right type of chemotherapy to slow down the growth of his cancer. Recently, it was discovered that somewhere along the way, John fractured one of his ribs. This has significantly contributed to the boughts of an already unbearable pain that he endures due to the cancer. As a result his daily mobility is now drastically limited. This pain has been fierce and constant and has shown no signs of easing up despite every effort to increase and change up his medication. John is now back at Richmond General Hospital where his medical team has been working on finding the best solution to help alleviate his pain. On Monday John is scheduled to receive radiation therapy to his ribcage unless scans show other problem areas that need to be addressed. Throughout this ordeal John has once again shown incredible strength and resilience but his fight to take hold of this disease battles on. Time, it is the measure used to determine how successful or sometimes unsuccessful a race has been. For John, he is all about his time…calculating how fast his splits were per kilometer was extremely important to him and gave him a goal to work toward. John often wore a wristband during training runs that had specific time intervals written down so that come race day, each kilometer was meticulously mapped out. To John every second in his race mattered and he wanted to make sure he was doing everything possible to keep himself on track. This gave him a focus and the determination to stick with a plan and finish each race in the time he had expected himself to. But as we know, sometimes no matter how prepared and diligent you try to be, you cannot plan or prepare for the unexpected. A few weeks ago, when more scans and tests results came back we learned the unfortunate news that John’s cancer had not only metastasized into his pelvis, but also into other areas in his bones. The scans also showed that there were small spots in his liver and in his lungs; to what degree, however, still remains uncertain. In this unpredictable race that John is running, time is something that he is not able to predict. The pace with which the cancer grows and the hope that we have that his treatment will slow it all down has yet to be determined. We want time to be more on our side then it actually appears to be at this stage in the course but the game plan continues to stay the same…the fight is still on and the will to keep on putting one foot in front of the other remains steadfast. John has already received 5 rounds of radiation to his pelvis and in the coming weeks he will likely receive a few more bouts to other spots that have been causing him pain. He has had a port inserted below his left collarbone, just under the muscle, so that his chemotherapy can be administered intravenously at home and without the need for him to be continuously poked with needles. Unfortunately as of late John was extremely sick from toxic calcium levels in his bloodstream due to bone breakdown from the cancer. He spent 2 weeks in the hospital getting medication to combat this problem and with the help of his Doctors, John also spent this time figuring out the right dose of pain medication to alleviate his discomfort. Now that John is finally home he will spend the next several weeks going back and forth to the hospital to receive chemotherapy treatments. He has a great team of Doctors behind him and we are very thankful for their support and expertise in helping John to navigate this leg of the race. The time that is left in John’s most challenging Marathon continues to remain an arbitrary number but we will continue to enjoy the journey, make every second count, and keep all hope alive! 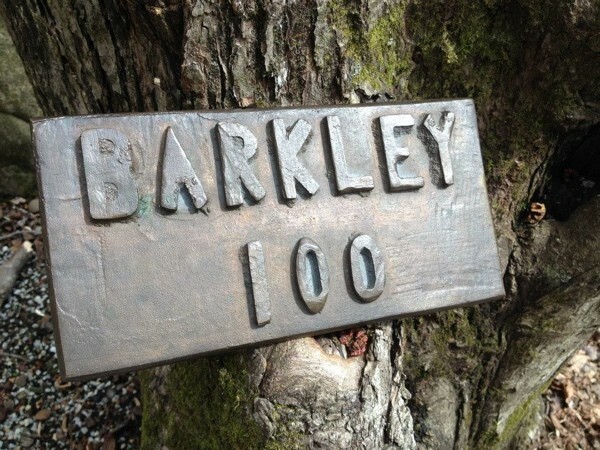 John and I recently watched a documentary film on The Barkley Marathon. For those of you, like me, who have never heard about this race before you should try to find some time to watch it, it’s on Netflix and it’s fascinating! This Ultra Marathon challenges participants to run over 100 miles through Frozen Head State Park near Wartburg, Tennessee. It is comprised of a 20 plus mile course where racers are required to complete 5 loops in 60 hours or less. 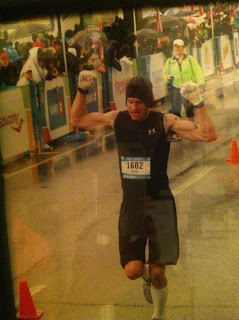 During the first 10 years that this race was held, no one finished and participants began to believe that no one could. The race is like no other, the terrain is unmarked, the elevation changes are drastic, there are no aid stations along the route and there are certainly no people lining the course cheering you on. After just one loop of this race 63% of runners do not continue and after only 2 loops, 80% usually quit. Since 1986 only 17 people have actually finished the race. I attribute the current state of John’s situation to that of the Barkley Marathon. After battling so courageously through the last 7 months of surgery, radiation, and chemotherapy, and despite the success of eradicating the cancer from his sinuses, John finds himself only completing loop 1 in this very difficult race. A race that he actually had no intention of signing up for in the first place! In March John’s first post treatment scans came back optimistically clear. No new cancer was detected and the “abnormal” images that did show up in his MRI were likely the result of scarring from the surgery and the high doses of radiation that John had been exposed to. His Oncologist seemed very confident and assured us that all looked clear in this region and scheduled a new scan to be done in mid June. 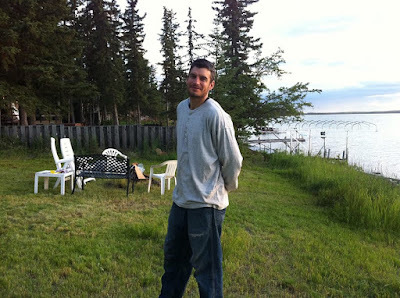 In the meantime John was slowly starting to feel better, he was outside more often, was able to drive the boys to their sports and was trying to get his body back into shape by walking, and lifting weights. However at some point in this recovery process, John pushed himself farther then he should have. Suddenly, one morning he woke up to a pain in his upper leg. He thought he had pulled a muscle from over doing it. In the next few weeks he stretched and limped through the discomfort until the discomfort turned to a painful ache. I urged John to see a physiotherapist and after only one appointment his physio asked him to get an X-ray so that she could rule out any possible bone fractures. The results of the CT scan to John’s pelvis was not what we were expecting, in fact it was not even on our radar in the slightest and it was nothing we thought to anticipate or prepare for, but nevertheless there it was. Six tumors have invaded John’s pelvic bone; two of them are as large as 5 and 6 cm. We have been told the hard reality that these tumors are “inoperable” and that we will need to rely on Radiation to stop its growth and possibly shrink its size. John's original cancer, SNUC, had metastasized through his blood and is now in his pelvic bone, whether there are more tumors on other bones or organs in his body remains to be seen. John will need to have a CT scan for his organs and we are currently awaiting the results of his bone scan. In the meantime radiation on his pelvis will begin tomorrow. Loop 1 of the “Barkley” began 7 months ago and was successfully completed, but loop 2 will now begin, and just like the actual race, he will be running this loop in the dark. John does not know what lies ahead, and he will have no way of seeing too far in front of him, so for now John must trust in the course and know that if he was able to complete one loop, then he certainly has the ability to complete another one. One step at a time, one day at a time, nothing will be taken for granted and nothing will stand in his way. Today we enjoyed a beautiful day as a family up at Grouse Mountain and tomorrow John will begin the next chapter of this Ultimate Marathon. The challenge ahead will be difficult, but John is not about to quit! The Finish Line...but not quite finished! There are a number of emotions that are attached to the finish line…there is that sense of completion, accomplishment, satisfaction, dissatisfaction, heartbreak, disappointment, elation and joy. Marathons have a way of exposing your weaknesses while also highlighting your strengths. The finish line may mark the end of the race, but for some it can also mark the beginning of a longer journey ahead. The last day of John’s final chemo cycle ended on Dec. 31, 2015. It was a perfect way to say goodbye to what has turned out to be quite the challenging year. It marked the end of his treatment plan and hopefully the end of any further cancerous growths throughout his body. Walking out of the clinic on that last day was a satisfying feeling for the moment, but the battle does continue even though John will no longer be subjected to the daily doses of radiation or chemotherapy. More recently John was hospitalized due to a high-grade fever and very low white blood cell counts, which the body needs to help fight any possible signs of infection. He spent 4 nights in the hospital wing of the cancer clinic where he received several litres of saline to combat his dehydration along with 4 pints of blood to increase his hemoglobin counts. John is now battling pneumonia for the third time and is his body is still going through the wringer from what has been a very aggressive treatment plan. But he is a true fighter in every sense of the word, and he will not let these set backs take away from the progress that he is inevitably making, regardless of how small it feels at times. It is often hard to believe that the body is capable of enduring so much punishment yet able to still come out healthier and better than ever before. If anyone can prove this to be true, it certainly will be John. The focus now is to ensure that John’s body is healing and that he is on the right path to a full recovery. John has run several races now and after each one he has looked ahead to the next one. He dissects aspects of his run that he can improve upon while also acknowledging what has worked. He has researched and learned a great deal from those who have had more experience, performed better, trained effectively or had pieces of advice to share. In the coming months I anticipate that John will begin to build a new “training regimen” for himself, one that contributes to the success of this race that he will continue to run. As the saying goes, John may have cancer, but cancer does not have him. We want to thank all of you who continue to support John throughout his journey. All of you have contributed in so many ways, particularly in lifting his spirits during some of his most difficult days! There are miles and miles yet to go when we consider what will be required for John’s recovery in the coming months. The first set of scans that will give us any indication that this has all been a success will not be until March, so although his feet may have just crossed that finished line, the race is far from being over!